If you can't see today's pictures, click here. We had a glitch and some of you can see them, some can't. Like this snuggling session with a "friend"
Who doesn't know how this will end? 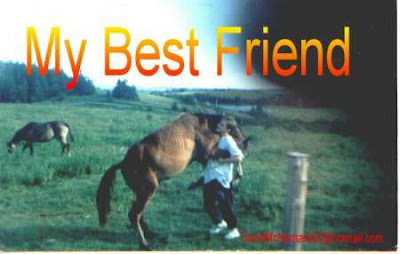 My horse and I, we're super close! He's a rescue and traumatized! Have I got a horse for you! A bay overo - ain't that cool? He's sure to get looked at a lot! I've turned down much more for him, of course! I'll sell for just $5500 today! Just what was this horse bred for? Sniffing for truffles? Sweeping the floor? I just have to ask WHY? WHY? WHY? Of riding a horse that's severely downhill! Or - better yet - alert the news! Finally found a use for those "Big Lick" shoes! A girl in a too-tight hoochie dress!